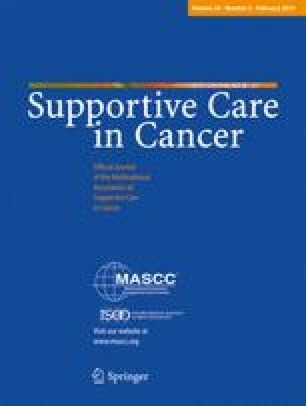 To assess the joint symptoms and the impact on patients’ health-related quality of life (HRQOL) due to 5 years of anastrozole from the baseline data in the N-SAS BC 05 trial, a randomized clinical trial was designed to assess the efficacy of 5 additional years of anastrozole among women with breast cancer. Joint symptoms and HRQOL were evaluated using an original questionnaire for joint symptoms, the Short Form 36-item Health Survey (SF-36), the EuroQol EQ-5D-3L, and a subscale of the Functional Assessment of Cancer Therapy-Endocrine Symptoms (FACT-ES). Baseline joint symptom and HRQOL data were collected from 330 patients between November 2007 and March 2010. Joint pain and joint stiffness were reported by 61.6 and 59.1 % of patients, respectively, although these symptoms did not affect the activities of daily living in 96.0 and 97.9 % of patients, respectively. Joint pain was reported in the knee by 61.0 % of patients and in the hand by 36.0 % of patients. Joint stiffness mainly affected the hand (67.9 %), especially the proximal interphalangeal joint, and typically occurred upon waking up or in the morning. Most SF-36 domains had good average scores, although slight decreases in physical functioning and role-physical were observed (compared to the national standard scores). The mean EQ-5D utility score was 0.86, and the total FACT-ES subscale score was 62.2/76. After 5 years of anastrozole, many of the patients reported joint pain and stiffness in mainly the hand and knee with mild symptoms and good HRQOL. The online version of this article (doi: 10.1007/s00520-015-2830-6) contains supplementary material, which is available to authorized users. This study was supported by the Comprehensive Support Project for Oncology Research (CSP-OR) and the Comprehensive Support Project for Health Outcomes Research (CSP-HOR) of the Public Health Research Foundation. The corporate and individual sponsors of this study are listed on the CSP-OR website (http://www.csp.or.jp/cspor/kyousan_e.html). The pharmaceutical manufacturer/distributor played no role in this study, except in providing information regarding the proper use of the study drugs. All decisions concerning the planning, implementation, and publication of this study were made exclusively by the executive committee. We would like to thank Editage (www.editage.jp) for the English language editing. Ware JE, Jr SF-36 Health Survey Update. http://www.sf-36org/tools/sf36s.html.